I create flawless, on trend wedding cakes for discerning and stylish couples in Dorset, Hampshire, Surrey, London and beyond. With a flair for contemporary design, I’m known for trend-led colour palettes, couture inspired textures and lifelike sugar flowers that bring contemporary elegance to your wedding. I regularly look to trend setting leaders in their field around the world to bring freshness to my work and ensure your cake really stands out from the crowd. Working closely with you, I bring our ideas to life with a creative eye and 7 years of professional expertise. And because you’re not tied to pre-set designs, you can experience the true luxury of having exactly what you want. From the moment you first get in touch to delivery on your wedding day, I do everything myself so that I have full control over every detail. I don’t make lots of cakes because honestly, I’d rather make 2 incredible cakes than 5 average ones! This means that you benefit from the kind of exceptional quality that you only get with an artisanal business, plus a delectable menu that is always changing. My passion for cake design began when my world fell apart. The car crash which left me with severe injuries and two small children to support, also ended my career in the operating theatre. Instead of focusing on what I had lost, I embraced my love of baking and threw myself into the kitchen and into my rediscovered love of decorating cakes. All the Saturday afternoons that I used to spend with my Nan as she shared her sugarcraft tricks came flooding back, and I lost myself in creating new recipes and updating my dusty decorating skills. Since then, I’ve spent 7 years refining my decorating style and flavour profiles. Each cake has an undeniably romantic feel, blended with soft colours and a modern edge. 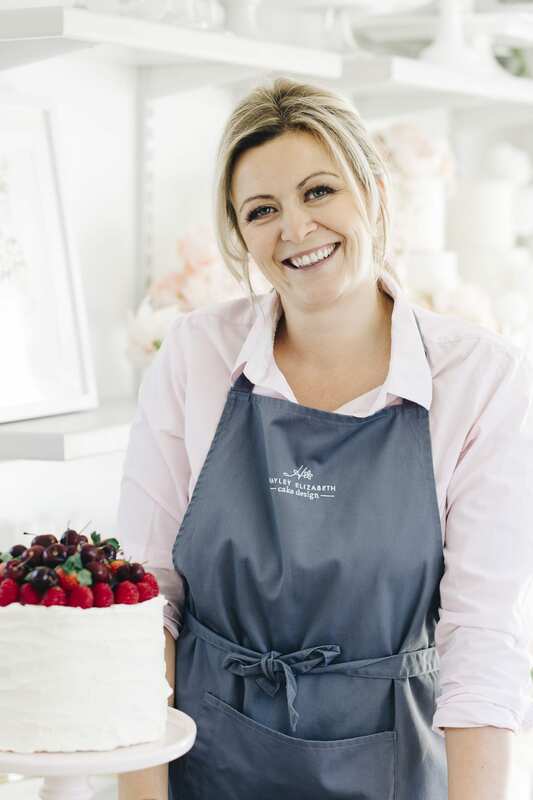 It’s also incredibly important to me that the flavours are just as stylish as the outside, with combinations such as peach melba, white chocolate and passionfruit and hazelnut tuxedo cake all making mouth-watering options for a modern wedding. 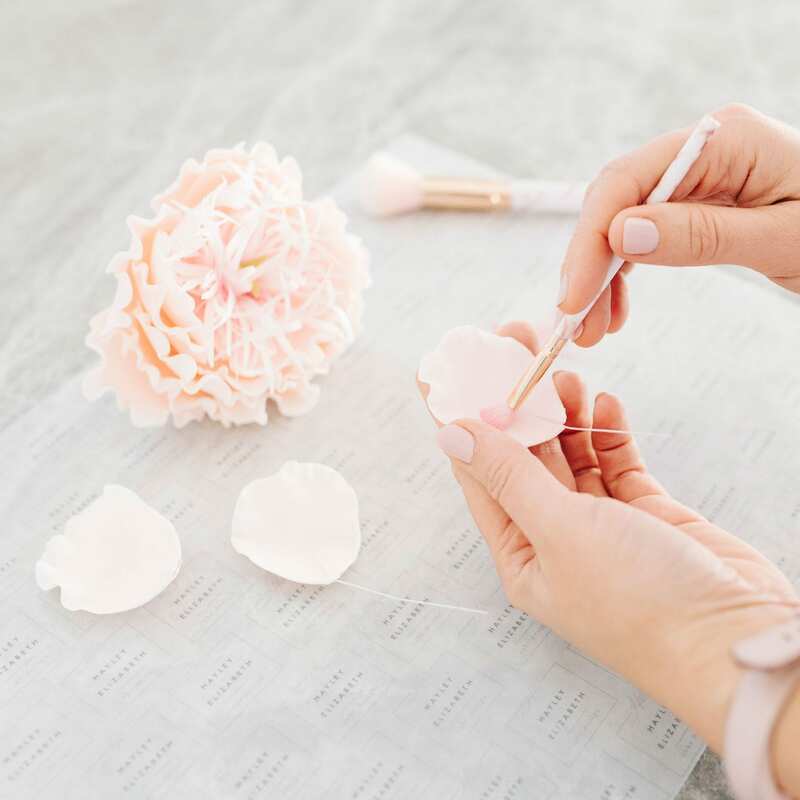 You’ll often find me in my garden studio playing with wafer paper and texture, coaxing gumpaste into beautiful sugar flower forms and inevitably dabbling with pink… I just can’t get enough of it! In between cakes, there’s a good chance that you’ll catch me with a cuppa immersing myself in my other passion of interior design. The creative outlet that cakes gave me was a life-saver… and the reaction from the people who see and eat the cakes is an amazing feeling. I love how cake brings loved ones together to reminisce over memories and create new ones. Yummy, professional, decorated with detail and thought... just perfect in every way. I felt I was listened to throughout the whole process so we really ended up with the exact wedding cake we wanted. The cake was the most incredible edible thing we’ve ever seen! Hayley went above and beyond our expectations.